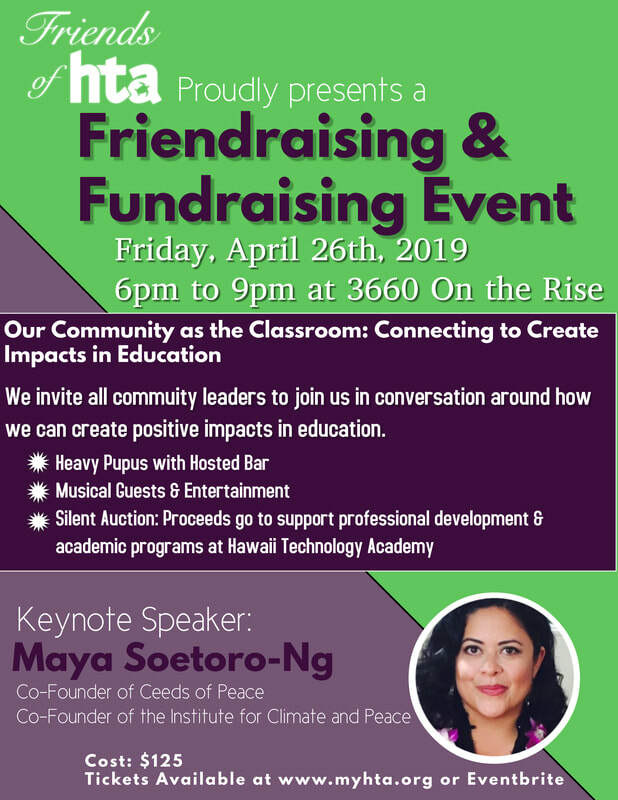 Can't attend our event but would like to make a donation to support students and programs at Hawaii Technology Academy? Maya serves as a consultant to the Obama Foundation, working closely with their international team to develop programming in the Asia Pacific region. Prior to her work with the Obama Foundation, she was the Director of the Matsunaga Institute for Peace and Conflict Resolution at the University of Hawaii at Mānoa where, in addition to leading outreach and development initiatives, she also taught Leadership for Social Change, History of Peace Movements, Peace Education, and Conflict Management for Educators. She was awarded a master’s degree in Secondary Education from NYU's College of Education and a PhD in Multicultural Education from the University of Hawaiʻi. For many years, she worked at the University of Hawaiʻi College of Education where she taught Multicultural Education, Social Studies Methods, and Peace Education at both the graduate and undergraduate levels. Maya has published a number of book contributions as well as a picture book entitled Ladder to the Moon and is currently under contract to write a Young Adult novel entitled Yellowwood . Maya sits on many voluntary boards and is the co-founder of the nonprofit Ceeds of Peace, which creates peacebuilding action plan workshops for educators, families and community leaders and is the co-founder of the Institute for Climate and Peace which advances effective and inclusive processes to build peaceful and climate-conscious futures for the wellbeing of all. Validated Parking is available in the building's Parking Garage for our guests.